Hosting a 70s party has never been more popular. The 70s is a great decade to choose and with flares back in the shops, you can look fashionable too! This page gives you some top tips for the perfect seventies party. For real authenticity you need Watney's Party Seven or Party Four - but sadly you can no longer buy it these days. No party in this era would have been complete without one! Keg bitter was definitely the drink of the early seventies. "Classics" such as Watneys Red Barrel (or Watney's Red as they tended to call it then), Double Diamond, Courage Tavern and Worthington 'E' are well out of production. In the later 70s, lager began to take hold. You can still get seventies favourites such as Skol, Carling Black Label (they paid a consultant millions of pounds to recommend that the 'Black Label' was dropped some time in the 90s), Carlsberg and Tennant's Pilsner, though whether it is the same, who could say? Light ale was a popular alternative to lager at the time. You used to be able to buy Courage Light Ale in Co-op stores until a couple of years ago. I've not seen anything similar for quite a while now. Aside from beer, wine drinking was beginning to gain popularity. Tastes in wine have changed dramatically since then. For the authentic seventies party I would go for German wines. The market was dominated by brands such as Blue Nun. Its popularity continued well into the 80s. That other favourite brand was, of course, Mateus Rose from Portugal. For posher parties go French. Classics Burgundies, such as Chablis, were popular in the 70s - a bottle of this was even ordered in Fawlty Towers at the gourmet evening! 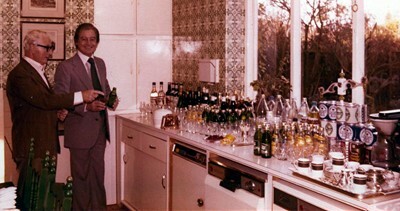 For a great 70s party you could make a wicked fruit punch. Vermouth was another favourite; the heavily promoted Martini (any time, any place, anywhere), Cinzano and Noilly Pratt were the popular brands. All are still available. Generally they were mixed with lemonade for the classic long drink. Other favourites were gin and tonic, whisky and soda or lemonade and vodka, especially Smirnoff, which was gaining a following. Of course you need a Sparklets soda siphon for the soda! Even an empty one is a good prop. You should be able to pick one up for a few pounds in a charity shop. 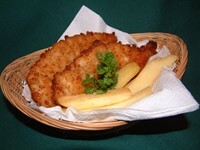 Here is something special you might want to try as a cool ap�ritif for a 70s party. 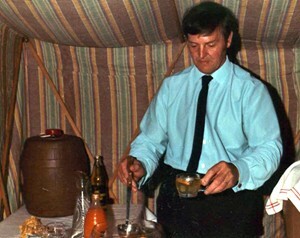 In an early episode of the Sweeney, Inspector Jack Regan, played by John Thaw, made a mean 'Bloody Mary' cocktail to impress a lady journalist. 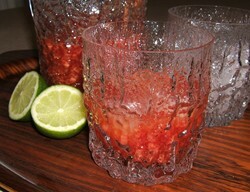 To make this recipe, mix tomato juice and vodka to taste in a jug. Squeeze in some lime juice from fresh squeezed limes. Add Worcester Sauce, or for a really spicy mix add Tabasco sauce. Pour over ice and enjoy. It is surprisingly refreshing. Strictly speaking, you should use highball glasses for a 'Bloody Mary', but we thought these 70s Whitefriars tumblers really looked the part. This 70's Dinner Party CD is absolutely fabulous. May be these are not the greatest tracks from the 70s, but they will the ones you will certainly remember. It starts with Manhattan Transfer's 'Chanson D'Amour'. Straight from Abigail's Party there's Demis Roussos' 'Forever And Ever' and 'Love To Love You' by Donna Summer [although the actual song on Abigail's Party was by Clare Torry]. Then there is Captain and Tennille, 'Do That To Me One More Time' and Leo Sayer's 'You Make Me Feel Like Dancing'. It will take you right back I promise. It is just the thing to get people in the mood for a great 70s Party. If you don't remember 70s, this 3 CD collection summarises what you would have heard in suburban homes up and down the country. Forget tortillas and Kettle Chips. Go for crisps in basic flavours - ready salted, salt and vinegar and cheese and onion. 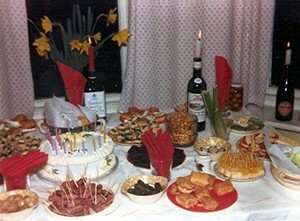 Another party favourite was cheese and pineapple on cocktail sticks. Create a centre piece by halving a grapefruit, covering one half with silver foil and sticking the cheese and pineapples sticks into it. 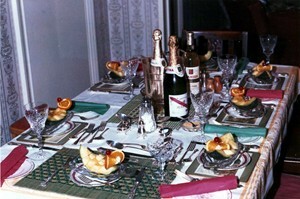 Dinner parties were gaining popularity. People were taking more holidays abroad and liked to be reminded of their holidays in Spain by enjoying Gazpacho and Paella back home. 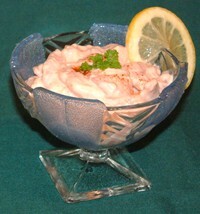 Other "exotic" favourites were inspired by meals from Indian and Chinese restaurants. Again the dishes were basic - chicken curry, sweet and sour pork, nothing too adventurous by modern standards. A dinner party was chance to show off and cookery books by (the late) Robert Carrier, Graham Kerr (the "Galloping Gourmet") and Delia Smith were often the inspiration for something a little more special. Spy novelist, Len Deighton, knew a thing or two about cooking as well. Harry Palmer, in the Ipcress File, was a great cook as well as as spy. There was that supermarket encounter when he explained the benefit of paying more for French mushrooms to his boss Kernel Ross. He also knew how to impresss a girl with a gormet meal. If you want some authentic recipes from the 70s Len Deighton's Action Cookbook is the real thing. They used it on the BBC programme 'Supersizers go.. seventies' in 2008. 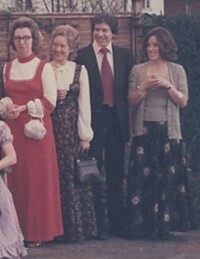 For most grown-up parties men wore suits and ladies wore long dresses. Suits, of course, had flares and jackets had wide lapels. Ties were wide. You might struggle to pick up something suitable these days. The classic 70s suit has not quite come back into fashion and collectors have snapped up most of the charity shop bargains. If you are going for something more informal, then the choice is much wider. Most seventies style leisure clothes are available in the shops now. Flared jeans, Simon shirts, wide collars, psychedelic and geometric prints are all available now. 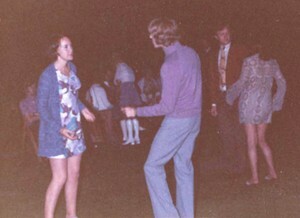 The first few years of the decade, up to '73 and '74 weren't much different from the 60s, except that everyone wore flares rather than just the hippies. The emphasis of mainstream fashion had changed for women. Skirts were maxi rather than mini. Fashion had become hippy.